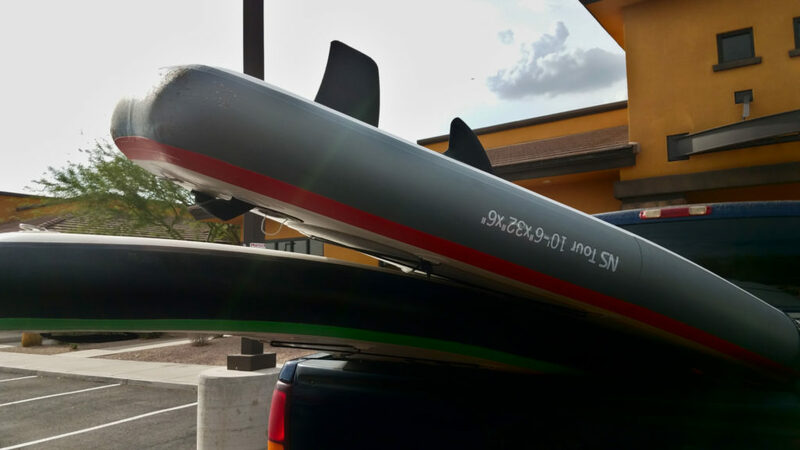 We headed toward Mesa, Arizona to rent SUP boards. This would be our first experience on a SUP board and I was very excited. At many vacation spots, I would see SUP boarders out in the water at all times of the day. Once, I saw someone practicing yoga moves on a SUP board. I figured it must be very stable. 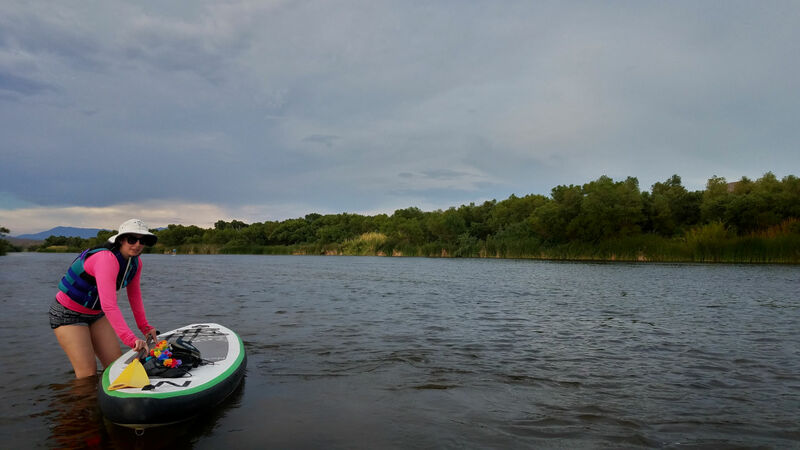 So, I added SUP boarding to my list of experiences to have. I quickly learned that there are many stores that have SUP board rentals. This was great because I was able to learn from websites what supplies to bring. Suggestions include lots of water, sunscreen, hat, sun protection shirt and camera with a waterproof case. There are bungee cords on the board to tie your supplies down. The SUP boarding rental shop we used supplied us with boards, paddles, and lifejackets. We had brought our own life jackets. The shop representative showed us how to store the boards in the back of the truck and how to tie them down. So that when we were driving to the Salt River, the boards would not fly out. We choose to SUP board in the evening for the sunset. That turned out to be a great time of day because it was July in Arizona and the sun was lower in the horizon and the landscape provided shade. The Salt River section we were in was not very deep, between 2-3 ft of water. We got into the water many times to cool off. We were also in a smooth water area. Which was great because then we did not have to fight waves or rapids. 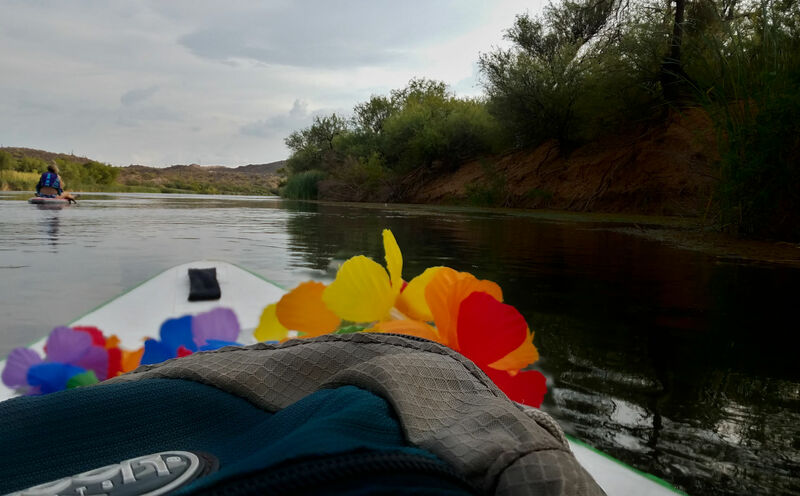 Ultimately we paddled up the river and then floated back down. The entire time lapse was about 2.5 hours. Then we got off the river and viewed the sunset from a park bench. It was a wonderful activity with a sunset view. 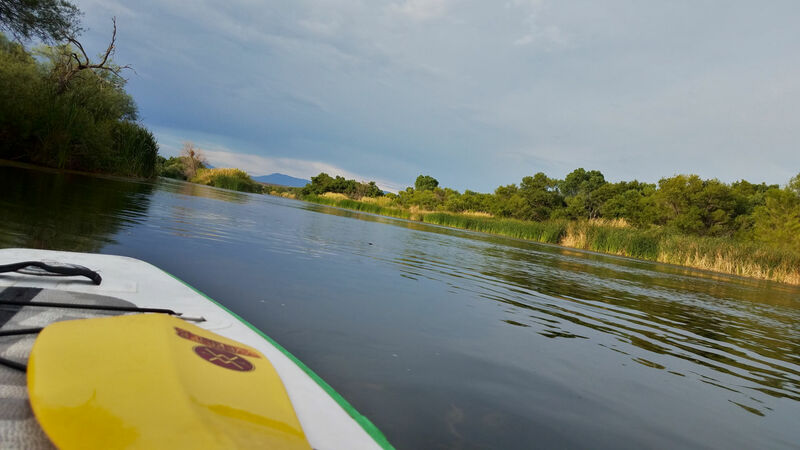 Have you ever SUP boarded? If yes, where? If not, would you try it? That would be a blast!!! Great information thanks for sharing!! WOW, what a great idea. As I’m not a great swimmer, the water being only 2 to 3 feet deep is an incentive to try something new. Water and sunsets are beautiful. What would be an estimate of equipment rental? It depends on the rental company. For 2 people, a parking pass, and all the equipment the cost was about $70. I love this idea! Mesa is beautiful but add water and fun and it’s perfect! You are right, Mesa is beautiful. What a fun day! I love to float down our river so I would definitely give this a try! This looks like so much fun! I have never tried it, but it looks like a great time. Glad you got to go in such lovely scenery! You are right, the scenery was lovely. I still have not Sup’ed. what a fun experience. I really need to do this. Need to find a friend with a SUP board! Check out rental companies too. Thye can provide all the equipment. Looks like so much fun! I really want to try SUP boarding some day and this looks like a great spot. Oh wow! I definitely want to try this sometime! That looks like so much fun!!! You would have a great time. I don’t know how to swim. But, if I did, this would be an activity I would thoroughly enjoy! I feel like I’m missing out on something. Sign up to receive notification of new articles.